By now you’ve been with me on a trip across half the US, taking the train from Little Rock via Chicago to Washington, DC. From there up the Northeast Corridor to New Brunswick, NJ, and finally in to New York City. Then on from there to Chicago and eventually back to Little Rock. In all 3232 miles of travel by train. During the 11 day trip, I spent 4 nights on trains. I chose not to get a sleeper accommodation, but rather travelled in coach. Even with 2 nights in a row on the train, that was perfectly fine. Amtrak long distance coaches, be that the 2-level Superliner cars or single level Amfleet coaches have very comfortable seats with plenty of room to wiggle and stretch your legs. The seat reclines and there’s a leg rest and a foot rest. When traveling I always bring some snacks and something to drink with me. Beyond that, I count on the on-board service for meals and wasn’t disappointed. The dining car provided good food. Some trains offer a carry-out service in coach, where the coach steward can order from a limited menu and bring to your seat. Costs a bit less than the dining car. Being seated with strangers in the dining car provided opportunities to converse and meet new people. Only onece did I end up at a table of 4 with a person who just wanted to eat and get out of there and not be social at all. 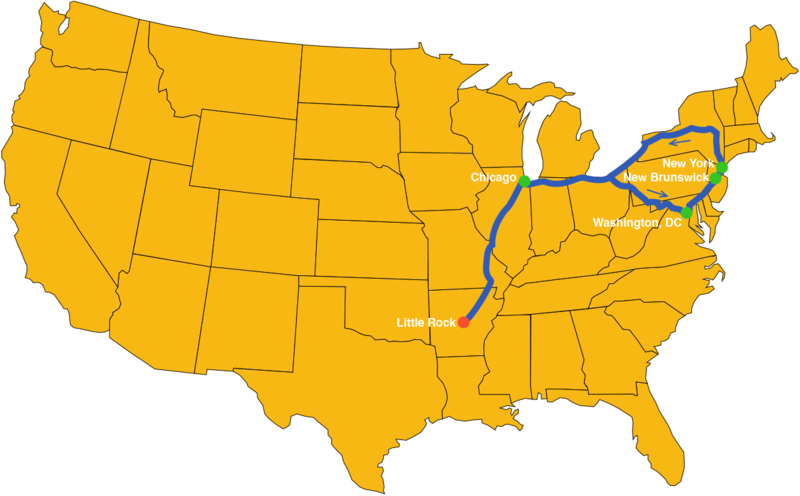 Originally this trip was all about getting from Little Rock to Washington, DC, for a meeting. I could have flown or driven. Have done both before. Did not fancy driving all that distance by myself, plus I-40 through Tennessee and especially I-81 through Virginia are full of trucks. By taking the train, I got from Little Rock to Washington in just a few hours more than driving and stopping overnight on the way would have taken. Plus I was rested when I got there. And was able to read and write on the way, as well as enjoy the sights. For quite some time I’d wanted to retrace my first train journey in the US, from New York to Chicago. It took place when I had just come to the country a couple days earlier. I knew how I remembered the adventure and wanted to see what it was like now, many years later. I was not disappointed, even with the train being quite late into Chicago. The ride along the Hudson River is spectacular. So is skirting Lake Erie. Lake Michigan gets intriguing in glimpses from the train every once in a while when you can see past buildings and old industries. For me that old industrial landscape is fascinating in its own right, so I enjoyed the ride. I decided I could definitely see taking a train trip for the purpose of focusing on my writing. Because you can move around on the train, you can find a good place with as much or as little distraction to hang out and get work done. Maybe the biggest bonus of taking the train was that I had “think time” — unpressured time to reflect, ponder and let concepts form. Would I do this trip again? Yes, in a heartbeat. I came back from the trip refreshed and energized with direction for what I wanted to do next with my business (even though this was not a business strategy planning trip). A definite bonus of the trip was that I got to catch up with several friends I hadn’t seen for a while. That, as the saying goes, is priceless. When traveling through Europe, I noticed the less money I spent, the more connected I became to my environment (air travel, train travel, hitch hiking, walking, etc.). We often would abandon our First class privilege to hang with traveling students. Totally agree. When taking trains to NYC I love looking at those’ fac-scapes’. And I especially liked your closing line. Remember kayaking? You were great! Thanks for your comment. You bring up a good point about how when we spend less money traveling, we often find ourselves closer to and more connected with people around us. A huge part of traveling for me is to be able to connect with other people traveling as well as the folks who actually live and work in the places I visit. And I will never forget the evening you took me kayaking. One of the priceless memories from the trip.